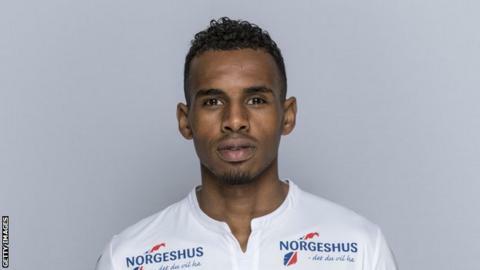 Liban Abdi: "I'd rather help Somalia than play for them"
As a youngster Somali-born Liban Abdi dreamed of playing for Norway but now hopes things improve in the country of his birth so he can play for them. The 29-year-old's youth career began at English club Sheffield United with World Cup stars Kyle Walker and Harry Maguire. He went on to play in Hungary, Turkey, Portugal, Norway and Saudi Arabia. He gained Norwegian citizenship as a refugee after fleeing Somalia as a child and is eligible to play for both sides at international level. The 29-year-old has been approached by Somalia for more than a decade and in the past looked on the verge of playing for Norway. "Of course it is tempting - Somalia remains a special part of who I am. But it's just not something I feel I can do until major changes are made there," he told BBC Sport. "It's still a scary, dangerous place and I'd be worried about people trying to use me to promote things that I don't want to be associated with. I refuse to become a player used for propaganda. Corruption is rife too. "When the Somali Football Federation (SFF) first called me, I was playing youth football for Norway and honestly, I saw my international future with Norway. "It wasn't about feeling disconnected from Somalia, in fact it was the opposite. "I thought moving to a bigger club, playing for Norway, would help me have a bigger profile and ultimately be able to do more for Somalia in terms of helping improve the infrastructure there." His assessment is difficult to dispute. Somalia have not played an international fixture in 16 months and currently sit rock bottom of the Fifa World Rankings, alongside the likes of Eritrea and Tonga in 206th place. Abdi is determined not to neglect his birthplace, however, and has already found alternative ways to contribute to the development of football. "I've done a few fundraisers and sent some equipment, footballs - that sort of thing. I work with NGOs and charities and so far that has been a better way for me to help. "Of course I would love to play for Somalia one day but only if I know that something good can come of it then. Unfortunately, the country is not at that stage yet." While his journey out of conflict via Kenya before eventually arriving in Norway may be a familiar one, his path to professional football is a little different. At 14, Abdi left Norway for England as his older brother and sister were heading to university. He turned out for local semi-professional club Buckingham Town "just for fun" and a career in football was never on his mind. Two years later he signed a professional contract with Sheffield United. "Truthfully, I never imagined I would become a professional footballer," Abdi explained. "At that time Sheffield United were in the Premier League and I just couldn't believe that I was there. I was born in a warzone. We moved to Norway as refugees. I was not supposed to make it as a footballer." Abdi admits that he is a little surprised how well his team-mates from the Sheffield United days have done and adds he is still in touch with some of them. "To be honest, I would never have guessed that they'd all do so well with their careers! The margins are so small at youth level and football can be brutal," he said. "You see so many talented players who don't make it because of bad luck so you never presume anyone will make it to the top. "Kyle Walker was a really good mate and we still talk. Did I think to myself, 'he'll be one of the best right-backs in the world in 10 years'? Probably not. "Sometimes he was on the bench and I was playing - it's funny how things develop. Now look at him - a fantastic player for Man City and England. "I'm really happy to see so many of the Sheffield United lads playing in the Premier League now." Abdi never made an appearance for the Sheffield United first team and since then his career has taken in eight clubs and seven countries - from Hungary to Saudi Arabia - in just eight years. Arguably the best football of Abdi's career came playing in the Portuguese top-flight with Olhanense where he scored against European heavyweights Porto and Benfica and faced plenty of big name players. "I played against James Roodriguez, Nicolas Otamendi and Hulk, among others. Hulk was just a freak of nature - he was so big and fast and technical, he really had the whole package," he reminisces. "I remember Otamendi was very aggressive but a bit of a hothead. He gave away a penalty when we played against Porto and had a poor game. It seems like he's got better since then though!" His most recent club was Al Ettifaq in Saudi Arabia but things did not work out - thoughts of family played a central role in his departure. "The club promised me when I signed that I could have visitors whenever I wanted but the reality was very different. I asked every day and nothing was done. We ended up terminating the contract; I got a bit of compensation and then I packed my stuff and left." A return to Norway is likely to be Abdi's next step - he is set to spurn other offers in the Gulf to head back to Europe. That move would put more distance between Abdi and Somalia but with his career far from over, the winger could yet play international football for he country of his birth.